There is a lot to love about summer, and corn and tomatoes have to be at the top of the list. What should you look for when picking out corn? 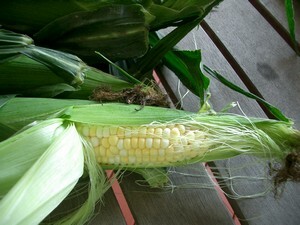 First of all, never buy already husked corn and don’t husk it or peel back the husk at the market. There’s no need, you just make a mess and you’re removing the corn’s protective wrapper. The husk should be green, tight fitting and fresh looking, it should look moist and not dried out at all. The silk at the tip will range from a light to a dark brown. Corn loses sweetness quickly, so only buy what you can eat right away. Store it in its husk in the coldest part of the refrigerator. If you have extra corn that you’re not going to eat in time, just cut it off the cob, put it in a freezer container (I use a zipper bag) and put it in the freezer. Grill it. Keeping it in it’s husk (you can remove the silk if you want, but it’s not necessary) just toss it on a hot grill. When it starts to get nice and brown, about 5 minutes, turn it. Keep cooking until the husk is brown all over, about 15 minutes total. Microwave it. Trim off the top and bottom of the corn and peel off all but the last two layers of husk. Microwave for 2 minutes per ear depending on the strength of your microwave and number of ears. This works best for 1-4 ears of corn. Boil it. 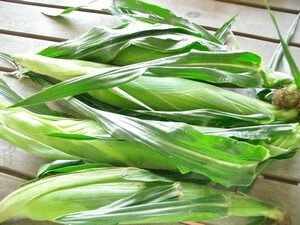 OK, now you can husk the corn, drop it in boiling water for about 5 minutes. For special effects points: when the corn is cooked and shucked, fire up a blowtorch and “brulé” the kernels until they’re dark brown. It makes the corn taste sort of like popcorn and impresses your guests. Thank you for this – and for reminding folks NOT to peel back the husk. So infuriating when you find a pile of mishandled ears at the market. Love your blog. Thanks for reminding me I have a bunch of flavored salts that would be great on corn. Just tried smoking some corn on the cob. Interesting, but great corn doesn’t need messing with.